It’s been three years since I found myself astride Nissan’s entry-level sports coupe. Debuting to much fanfare in 2007, the coupe’s looks aped that of its bigger, more potent brother; providing buyers with a fine counterpoint to the controversial appearance of Honda’s latest Accord coupe. And it still does. Although revised for 2010, the Altima still reigns supreme as the prettiest coupe of its kind; laying visual waste to Honda’s awkward Accord coupe. With a silhouette that mimics that of the Infiniti G35, the Altima Coupe’s details have been slightly worked over for 2010, earning itself a new hood, bumper, and grille. Looking a bit more masculine and substantially more mature by virtue of the newfound hood bulge, streamlined bumper, and additional grillework, the Altima’s image is bolstered even further by new wheels and upscale projector beam headlamps. However, although those new wheels measure a whopping 18” tall in the 3.5 SR trim tested, the Altima’s wheels still do little to fill the wheelarches, giving it a slightly skyward stance. But slide inside, and the Altima coupe feels plenty low. With a high beltline and a low seating position, it does a great job of emulating a proper sports car. The low slung seats are supportive, and a wide array of adjustment in both the seat and the steering wheel ensure that most drivers will be able to find a natural seating position behind the wheel. As with most Nissan products, the interior fit and finish is very good, with plenty of well-textured, soft-touch materials around. Picking up where Infiniti left off, Nissan’s interior designers have once again delved into their bin of strange metallic finishes, giving the Altima coupe’s metal trim a unique finish that may not be for everyone. But, that shouldn’t dissuade too many buyers, since Nissan’s also fitted the coupe with a tasty new multimedia system featuring a high-resolution navigation display, iPod and Bluetooth (with audio streaming) connectivity, a 9.3 gigabyte hard drive, and a backup camera. I found both all the major functions very accessible, and enjoyed the iPod interface especially. Using a familiar system of accelerated alphabetized scrolling, it didn’t take more than a few seconds to go from AC/DC to ZZ Top, and playback through the seven Bose speakers was excellent. That said, the Bluetooth microphone could be improved, as there were a few echoes heard on both ends of the line, with a few people remarking as to the poor call quality on the other end. For folks less inclined to get lost, Nissan is also offering most of that same multimedia system, albeit non-GPS enabled and equipped with a smaller, 4.3” LCD screen. Coming standard with Nissan’s Intelligent Key system, starting the coupe is a relatively undramatic affair, with none of the clamorous howl of the 370Z and G37 coupes. Settling to a smooth tickover quickly, the CVT transmission has none of the cold start jerkiness of a standard automatic, “shifting” smoothly right from the get go. In fact, the CVT transmission, which I expected to be the car’s weakest link, was downright excellent. Coupled to the big V6 producing 258 lb-ft, it surfs a wave of torque that starts at 1,500 rpm to push the coupe up to speed quickly and incredibly smoothly, saving fuel by sparing needless revs all the while. Should you push the car a little harder, it allows the engine speed to reach peak horsepower, and holds it there while the Altima accelerates around it. Although definitely a disconcerting feeling, the high-rpm rubber band effect works just fine, and dispatching slow-moving vehicles on two-lane highways was incredibly easy. And tackling the corners was just as easy. With light, speed-sensitive rack and pinion steering and a multi-link rear suspension, the coupe felt light and nimble; more at home picking apart tight, technical roads than bombing through high-speed sweepers. With great body control and remarkably communicative steering, the whole car came together quite well in the corners thanks to the combination of the V6’s ability to produce great power coupled with the CVT’s ability to control it. Limiting wheelspin out of the corners, it made it a lot easier to flow from apex to apex without worrying about upsetting the front end. Although the six-speed manual would definitely challenge the driver more and probably post a better time around most tracks, the CVT’s ability to mete out just enough power has the effect of linking corners together into one momentous, flowing drive. 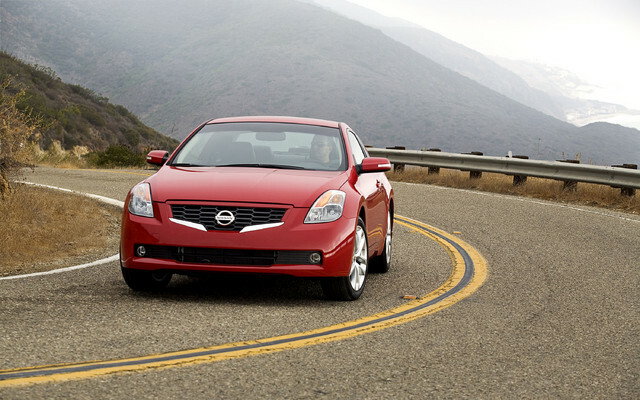 If that sounds appealing to you, then the Altima coupe is probably what you’re looking for. Not quite a max-attack affair of the 370Z’s fire-breathing ilk, the Altima is precisely what a sports coupe should be when it’s dialled down from 11. Smooth, supple, and surprisingly practical (9.8 litres per 100 kilometres isn’t a half bad fuel economy average for something producing 270 horsepower), it’s a good all-around sporty car for someone who can’t validate ownership of a sports car. But it does have its flaws. There seems to be nearly no sound deadening around the rear wheelarches (a complaint I filed with the 370Z as well) and the rear seats aspire to increase the War Amp’s membership. Likewise, the looks aren’t for everyone, Hyundai does build a compelling argument, and either Ford or Chevy would be happy to build you a more dramatic Mustang or Camaro for similar coin, but for those looking for a first rate front-wheel drive sporty two door, it’s hard to miss with the Altima coupe.